It's like classic Nuketown, but deader. PlayStation 3 and PC gamers can get in on some more rotting zombie action. The Call of Duty: Black Ops 2 Nuketown Zombies map is now available to season pass subscribers. Nick wrote up his impressions for the new addition to the cooperative Zombies mode when it first dropped for the Xbox 360 w-a-a-a-y back in December of 2012. 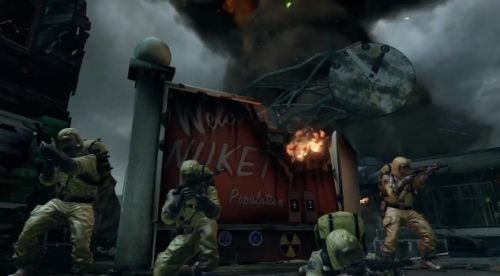 Nuketown Zombies is not part of the Tranzit system, it's for Survival mode, only. If you played Nuketown in the first CoD: Black Ops, you'll remember that is was a very small map that ensured vicious up-close-and-personal fire fights. As you might suspect, we found it rather claustrophobic for a Zombies match. The trailer below shows just how hard it is to defend the small, bombed-out houses from the walking dead. The Nuketown Zombies map is available now to anyone who shelled out $50 for the CoD: BO2 season pass. That subscription will also get you four new multiplayer map pack add-ons. The first of which, "Revolution," comes out later this month on the Xbox 360. It will most likely surface on other systems in late February. The Call of Duty: Black Ops 2 Zombie mode supports four player local split screen co-op and four player online co-op.